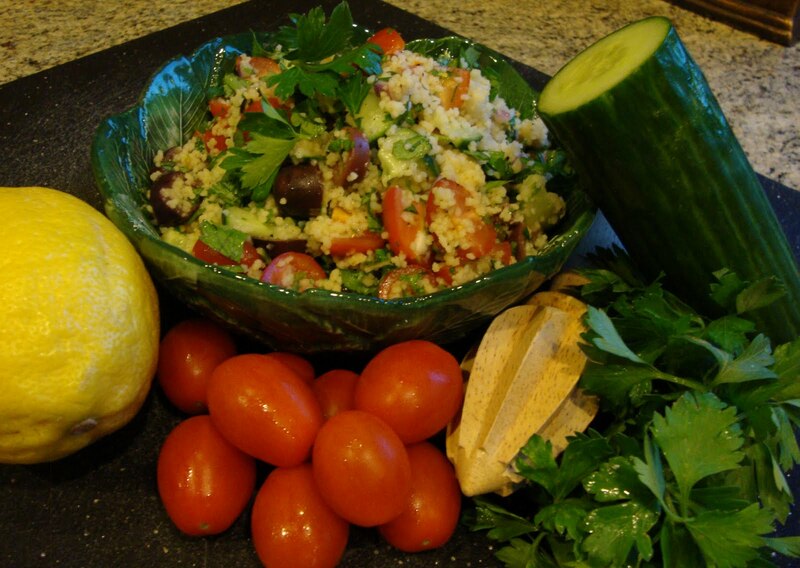 Kicked Up Couscous Tabbouleh – Life of the Party Always! Where’s the bulgur? 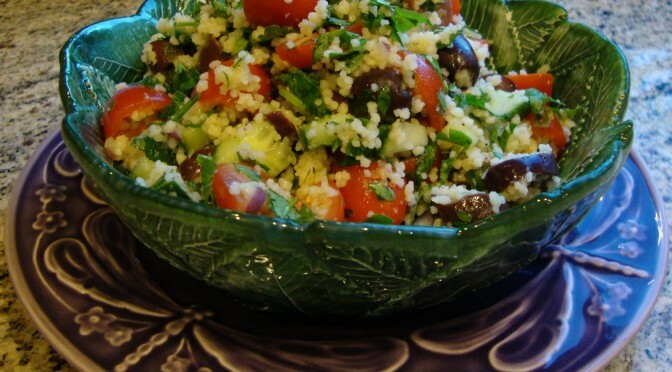 I really thought I had some from the last time I made Tabbouleh but there wasn’t a kernel of cracked wheat to be found and I was really craving this light, refreshing salad. Not to worry, Couscous to the rescue! It plays in beautifully with the Mediterranean theme and it could not have been better. Being creative with the ingredients you have is what makes cooking so much fun! In a saucepan combine the broth, the water, 1/4 cup of the lemon juice, and 1 tablespoon of olive oil, bring the mixture to a boil, and stir in the couscous. Cover the pan, remove it from the heat, and let the couscous stand for 5 minutes. Fluff the couscous with a fork and let it cool in the pan in the refrigerator. In a very large bowl combine the cucumber, tomato, red onion, Kalamata olives, Feta cheese, remaining 1/3 cup oil, remaining 1/4 cup lemon juice, lemon infused olive oil, and salt and pepper to taste. Let the mixture stand for 15 minutes while the couscous continues to cool in the refrigerator. 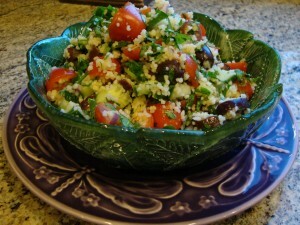 Add the couscous, the parsley, and the mint leaves, stir the salad well, and chill it, covered, for 1 hour. The salad can be made 2 days in advance and kept covered and chilled. Serve with grilled lemon chicken, hummus and pita bread or pita crackers.